Have you long dreamed of a new e-bike, but want to take it for a test ride first? 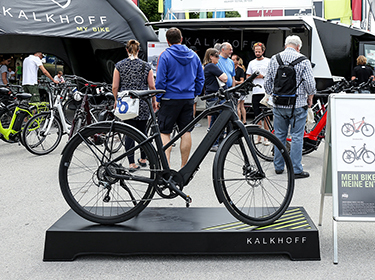 Then visit us at our Kalkhoff Testival Tour 2018. Our promotional trucks are travelling throughout Germany with the newest e-bike models. Visit us directly at your trusted Kalkhoff retailer to receive free and non-binding advice. Find out what your e-bike type is! Trust is great. Testing is better.